Herein is described in silico repositioning, design, synthesis, biological evaluation and structure-activity relationship (SAR) of an original class of anti-inflammatory agents based on a polyaromatic pharmacophore structurally related to bisacodyl (BSL) drug used in therapeutic as laxative. We describe the potential of TOMOCOMD-CARDD methods to find out new anti-inflammatory drug-like agents from a diverse series of compounds using the total and local atom based bilinear indices as molecular descriptors. The models obtained were validated by biological studies, identifying BSL as the first anti-inflammatory lead-like using in silico repurposing from commercially available drugs. Several biological in vitro and in vivo assays were performed in order to understand its mechanism of action. A set of analogues of BSL was prepared using low-cost synthetic procedures and further biologically investigated in zebrafish models. Compound 5c and 7e exhibited the best antiinflammatory activities and represent new promising anti-inflammatory agents for further preclinical development. Keywords: TOMOCOMD-CARDD Software, Atom-based bilinear indices, Anti-inflammatory database, Bisacodyl, Repurposing, Diarylmethylpyridines, Anti-inflammatory assay. Keywords:TOMOCOMD-CARDD Software, Atom-based bilinear indices, Anti-inflammatory database, Bisacodyl, Repurposing, Diarylmethylpyridines, Anti-inflammatory assay. Abstract:Herein is described in silico repositioning, design, synthesis, biological evaluation and structure-activity relationship (SAR) of an original class of anti-inflammatory agents based on a polyaromatic pharmacophore structurally related to bisacodyl (BSL) drug used in therapeutic as laxative. 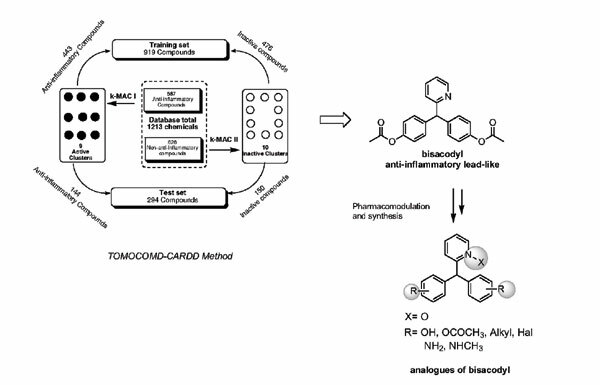 We describe the potential of TOMOCOMD-CARDD methods to find out new anti-inflammatory drug-like agents from a diverse series of compounds using the total and local atom based bilinear indices as molecular descriptors. The models obtained were validated by biological studies, identifying BSL as the first anti-inflammatory lead-like using in silico repurposing from commercially available drugs. Several biological in vitro and in vivo assays were performed in order to understand its mechanism of action. A set of analogues of BSL was prepared using low-cost synthetic procedures and further biologically investigated in zebrafish models. Compound 5c and 7e exhibited the best antiinflammatory activities and represent new promising anti-inflammatory agents for further preclinical development.